The SHSU Symphony Orchestra will present a “Classical (R)evolution” that begins with music expressing a vision of the divine and journeys toward a passionately earthy realm in their upcoming concert on Saturday (Nov. 10). Internationally renowned violin soloist Dylana Jenson will join the SHSU Symphony Orchestra in one of her areas of expertise—the music of Pyotr Tchaikovsky—on Nov. 10. 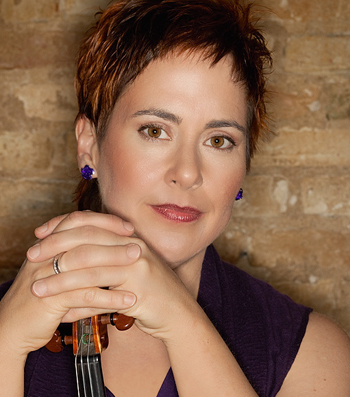 Joined by internationally renowned violin soloist Dylana Jenson, the orchestra concert will begin at 7:30 p.m. in the James & Nancy Gaertner Performing Arts Center Payne Concert Hall. Together they will perform “Violin Concerto in D Major, op 35” by Pyotr Tchaikovsky, a composer whose work helped make Jenson famous. In 1978, Jenson became the youngest person, as a woman and an American, to win the silver medal in the Tchaikovsky Violin Competition in Moscow, which was part of the Soviet Union at the time. “Ms. Jenson’s approach to the violin has a clear lineage back to Tchaikovsky,” Carrettin said. “Her teacher studied with the violinist for whom Tchaikovsky initially dedicated this concerto. Tchaikovsky’s “Violin Concerto in D Major, op 35” is “an expansive orchestration,” Carrettin said. While Ms. Jenson’s performance illustrates the earthy and visceral with Tchaikovsky’s “Violin Concerto,” the program begins on an esoteric, mystical plane. Carrettin’s program illustrates this descent from the divine to the earthly beginning with Giovanni Gabrieli’s “Canzona in the Ninth Mode” from “Sacrae Symphoniae,” written in 1597 for brass instruments. Carrettin places the brass instruments above the orchestra in the choral balcony on both sides so that the music is stereophonic. “I hope that it will clean out our ears so that we start off the evening’s experience with a heightened awareness,” he said. Written during Haydn’s “Strum und Drang” period, “Symphony No. 49 in F minor” can easily be characterized as dark and driving. To best serve this evolution of music, Carrettin has been constantly altering the placement of the orchestra sections to best take advantage of the hall’s acoustics. For the Haydn symphony Carrettin pulled the first violins to the edge of the stage, pulled the cellos back and turned their instruments towards the audience, split the string bass section so half is on one side and half on the other, and got rid of all the risers. Tickets are $15 adults, $12 seniors and $5 for SHSU students. To make reservations, contact the GPAC Box Office at 936.294.2339 or to buy online, visit http://bit.ly/S9WNHX.